I’m on an airplane, working on my translation of Kiyotsune into Italian. The beauty of the poetry is too much to take and I cannot stop the tears rolling down my face. I do my best not to be too self-indulgent, but… It sometimes happen at okeiko, too, and I think I saw my teacher also crying when we were rehearsing the ji-utai for Tomoe. Anyways, I just wanted to jot down a brief thought, perhaps a truism. I feel lucky not being a Japanese native speaker because otherwise I would not be able to enjoy bringing Kiyotsune into my native language. All this work of searching, decoding, reflecting, writing, re-writing, changing, making mistakes, correcting them, modelling, adapting…. Translating… What a delight. What a moment of deep transformation and union with the character. Translation can’t be betrayal as long as one accepts that in this life everything is transformed. One thing is thinking it, another is feeling it. 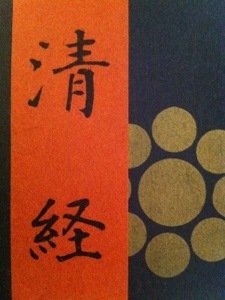 I am pleased to announce that on 29 June 2013 I will take shite lead role in the Noh Kiyotsune「清経」on the Kongo Noh Theatre stage, in Kyoto, Japan. 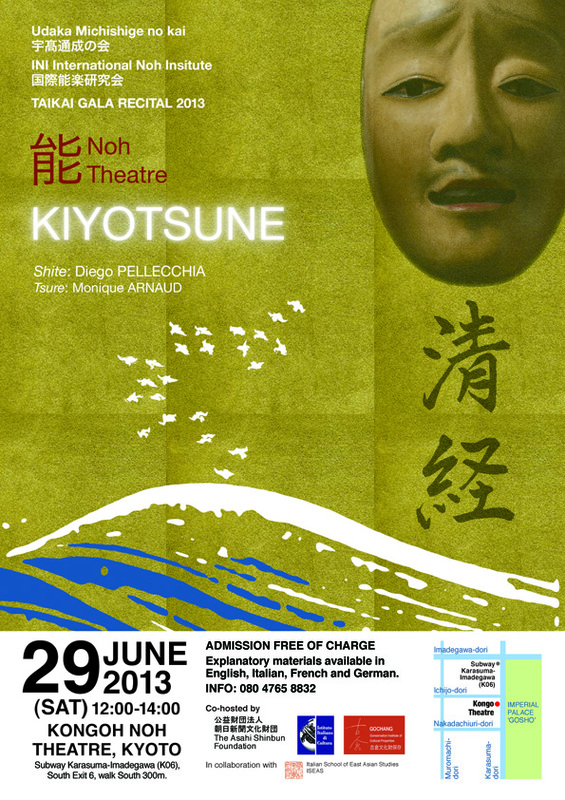 This will be my first performance as shite in a full Noh production. 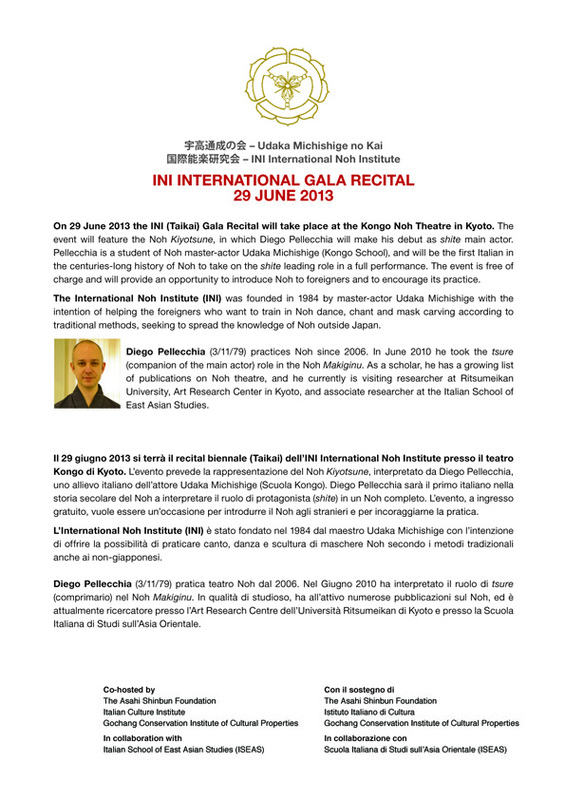 The event is part of the INI International Noh Institute 2013 Gala Recital, featuring other performances by Japanese and international students of Udaka Michishige, and is co-hosted by the Asahi Shibun Foundation, the Istituto Italiano di Cultura, and Gochang Conservation Institute of Cultural Properties, in collaboration with ISEAS Italian School of East Asian Studies. I will post more on Kiyotsune during the following weeks, so watch this space for updates on rehearsals, thoughts, and pictures! I look forward to meeting you all on 29 June 2013 in Kyoto! FREE ADMISSION Explanatory materials available in English, Italian, French and German. 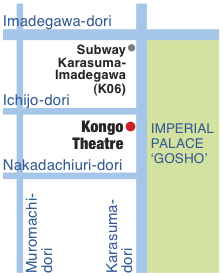 Kongo Noh Theatre Subway Karasuma-Imadegawa (K06), South Exit 6, walk South 300m. AsiaTeatro is a new project coordinated by Carmen Covito (writer and translator), dedicated to the dissemination of knowledge of Asian traditional performance in the Italian language. AsiaTeatro is both a website and an academic journal. The website offers introductory notions of performance traditions belonging to the four geographic areas in which it is subdivided (Japan, China, India and South-East Asia). Subsections dedicated to specific genres explore in greater detail each topic, while a rich bibliography provides the reader with a general overview of the scholarship produced to date. The content of the sections is written in a style devoid of specialist jargon or theoretical shorthand, and is a valid and much needed resource for Italian students, or for anyone who wishes to take an interest in Asian performance.